After a month in a flat, the market did come to life for a brief moment. On October 15, at 5pm GMT, a coordinated cryptocurrency buy out began. For an hour and a half, almost synchronously, on 10 top cryptocurrency exchanges, bitcoin grew by $1,000 on an average. The maximum increase occurred at Okex, which amounted to a total of $8,100 for bitcoin. The cryptocurrencies prices have reacted to the fall of the overall market capitalization which began at the start of October. The index fell by 4% for the first time in two months. After the jump in prices for the coins, the capitalization index continued to fall. This creates a chance for a new breakthrough for cryptocurrencies. Another reason for the rapid growth on Monday is the flat, which has been forming throughout the whole of last month. In the area of ​​the lower border of the flat, $6,500 large players accumulated their positions. After reaching the required volume, the bots began to actively buy up bitcoin and thus driving the price to the upper limit of the converging triangle, which has been forming since the beginning of this year. According to classical technical analysis, buy orders are placed above the upper limit. Thus, above $7,000, significant volumes of purchase orders were placed. Last week's growth is more like a short-term speculation - buying for $6,500 and selling above $7,000. 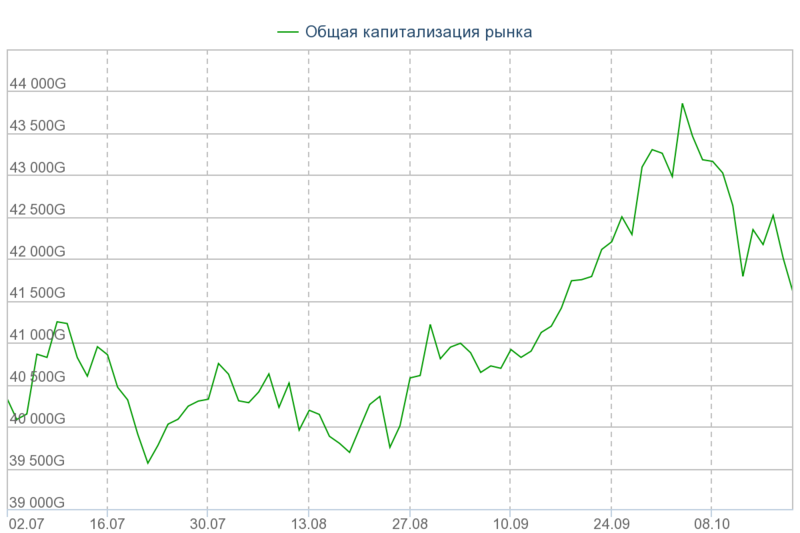 Due to instant sales, the price of bitcoin collapsed again. Mike Novogratz sees no reason for long-term growth this year. He said in an interview with Bloomberg on October 15 that as long as institutional investors do not come to the market, one should not wait for growth. A month ago, Mike predicted that the bottom was reached, but this year he does not expect significant fluctuations. He suggested that large investors would appear in the first or second quarter of 2019. This may contribute to several new projects that will appear next year. One of such projects is the consolidation of the liquidity pool of the OKEX cryptocurrency exchange with a regulated global network - GLASS. The platform was developed by SharesPost, which is part of the FINRA commission. Thanks to this platform, the trade will become regulated. The upper limit of the triangle of bitcoin has been broken, but the upward movement has not continued, which means that another wave has formed in the flat. So far, the probability is in favor of the flat downward wave to $6,300. Support for this option was already provided on Monday, and on the weekend, when rolling back up on the Bitfinex and Okex exchanges, supply exceeded demand. Buying in the middle of the flat is unprofitable. If the rate reaches the mark of the highest sales volume of $6,900, then the buyers will show up. Since bitcoin is in a flat, most likely the price will push down from this level. If the rate is fixed at $6,900 and reverses upwards, then growth will be the reversed, at least to the peak of last week. Constantinople hardfork on the ether network will not be implemented at least until the next year. This decision was made by the developers because they found software errors that occurred during the test on the Ropsten network. Price of ethereum has formed a potential reversal wave upwards, towards the correction. A rollback to an uptrend from $170 has already been forming for around a month. Growth levels since early September are a correction to all long-term downward movement on ether. 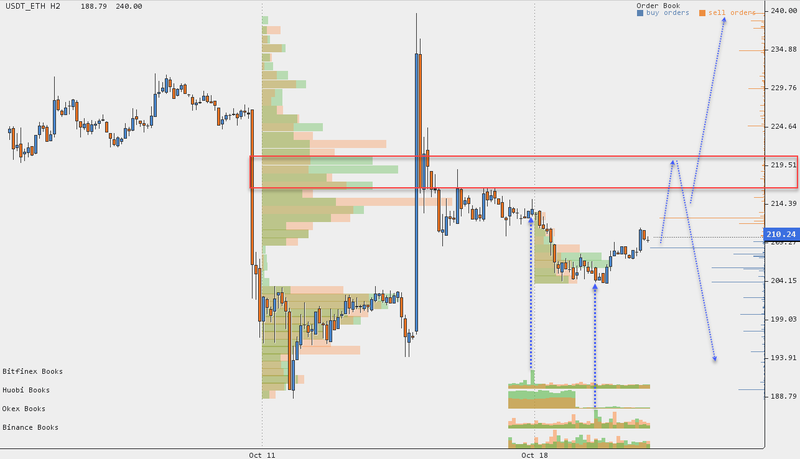 In order to reverse this trend, the price should turn upwards at levels that are important for sellers. 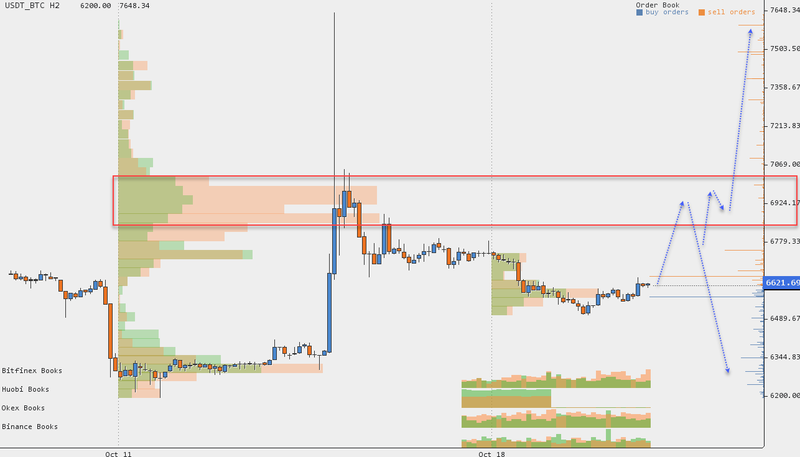 The closest level for mid-term sellers is in the $260 area. Some buyers place purchase orders to break through such levels. Therefore, if there is a reversal inside the current correction, then it’s highly likely that after breaking through the peak of $260, the rate will fall again. At this point, sellers will record large volumes at a single price. If the price forms a reversal of up to $260, then there are no sellers at this level. Under such conditions, ether can grow to $300. By the end of the week, the British currency broker Moneynetint announced the introduction of decentralized exchange. Now, change corporate clients will be able to exchange money within the Ripple network without a need for the banks. The price of XRP reached the sales volume mark and began forming a flat. After the fall from Monday, at the two leading exchanges Binance and Okex, at the peak of the correction, some considerable demand was recorded. Sales were insignificant, as the XRP price became entrenched. But so far, the wave of $0.38- $0.52 is a correction. When turning upward by $0.5, it will mark the first wave in an uptrend. If this mark is reached, there will be no large sales, and at this point a reversal will be formed. Unlike XRP, after bitcoin cash grew, the price failed to consolidate. 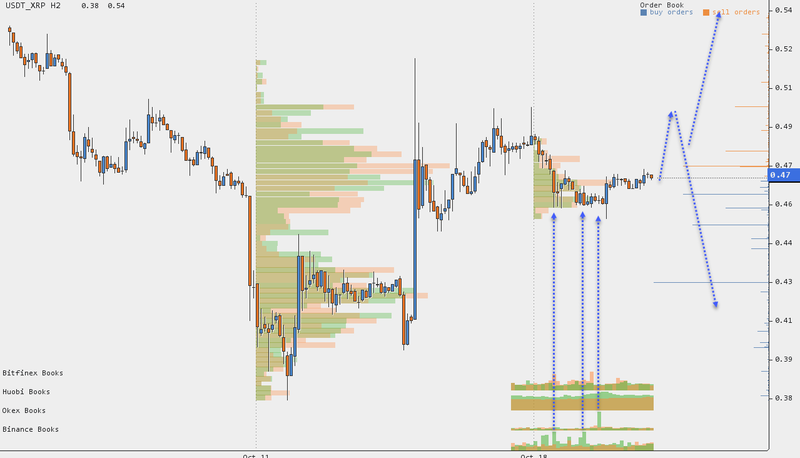 The rate literally bounced down from the largest volume of buyers. Those who invested in bitcoin cash during its growth at the end of September hoped for it to continue, but the price fell again. At the peak of growth on Monday, these traders were selling, alongside the one leading the upward trend. As a result, a new flat, downward wave was formed. While the flat is being formed, the situation will remain uncertain. Already near the bottom of the flat at $440, supply increased at Binance, Okex and Bitfinex, but not the demand. The situation surrounding the coin remains uncertain. It is better to wait for the reactions at the boundaries of the flat $440 - $550. 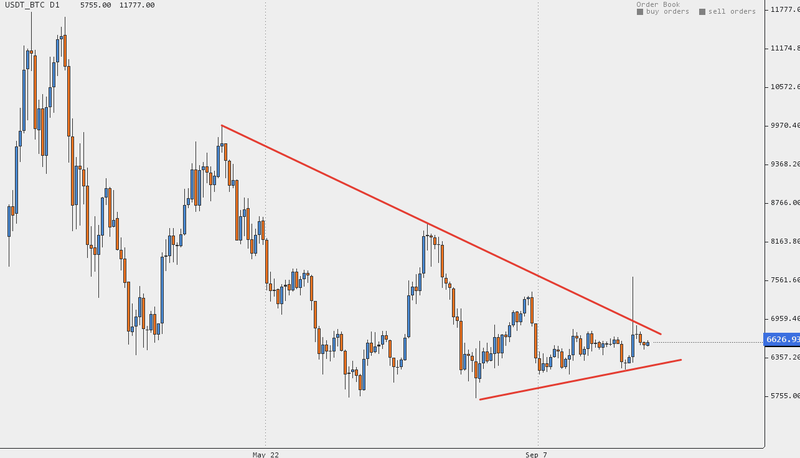 As long as there is no reversal at these levels, the price will make false breaks at the upper and lower boundaries.